Successfully Added Multi-Media Video Glasses (50 Inch Virtual Screen, 4GB Internal Memory) to your Shopping Cart. Imagine being able to watch movies on a 50 inch cinema display while on the bus, on the plane, in a park, or on the beach… Well, this dream has finally become true all thanks to these amazing portable video glasses! These video glasses work by using the left and right eye display to produce a 50 inch virtual cinema screen that will make you feel as if you are actually sitting in a real movie theater. The glasses themselves are lightweight and comfortable enough to wear for extended periods of time and feature an advanced micro TFT screen which has been carefully engineered and fully tested to ensure no harm to your eyes is ever possible. 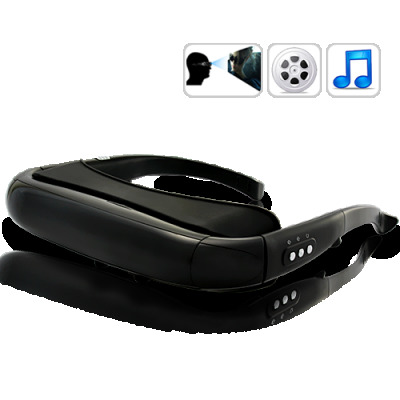 Everything from movies, music videos, photos to eBooks can easily be played by these incredible video glasses. Fully equipped with surround sound speaker headphones, they play crystal clear movie theater sound anytime you desire. With these video glasses, it’s even better than going to an actual movie theatre, because there’re no other people sitting around to disturb you! Best of all, this product comes with a 4GB internal memory for you to store all your favorite multimedia files. Movies, music, photos, ebooks…take them all with you wherever you go! Order this amazing product now and we will express ship your order by tomorrow. And don’t forget this product is fully backed by our 12 month guarantee and is in stock now and available for single piece or bulk orders. Brought to you by your source for awesome high tech gadgets, Chinavasion. Put on the video glasses and whisk yourself away to a magic land of exciting movies, music, and books. Great for dentists to keep their patients entertainment while receiving treatment. An excellent way to keep the kids busy with while at the same time not disturbing the driver!